The owner of our wonderful Artisan’s stores, Ron Whitmore, has a great Art Fusion Radio Show on 1260 AM. 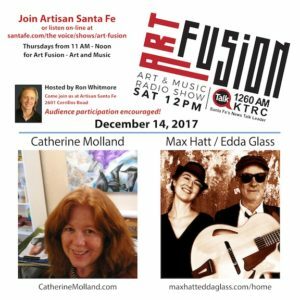 Ron is a musician and his Art Fusion Show combines musicians with a visual artist. I was invited to be interviewed with my talented musician friends, Edda Glass & Max Hatt. We had a great time and I’m very pleased with the interview! You can easily listen to it by going to SantaFe.com and entering Art Fusion in the upper box. Enjoy!